Insert the bottle cap into the glass. Press each plate properly then shake your phone so that the bottle cap goes into the glass. Slide each chair to the right and left for instructions. Press the numbered circle and then press the number 1269. Press each part of the ladder to get the same picture in sequence. Press the candle on the left to see the sequence lit up. 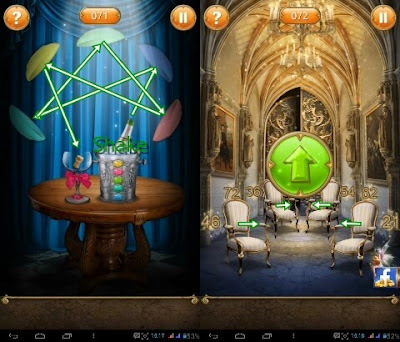 Press each candle on the right according to the candle flame sequence on the left. Press each pink button so that the box rotates and a circle appears in the center of the box.